Gmail is one of the Web page for people around the world use a lot, this is a very easy to use application and is convenient for all activities. Although Gmail has more beauty, but it still has its drawbacks, sometimes alone or encounter any visual mailbox, that you feel such hate, right? 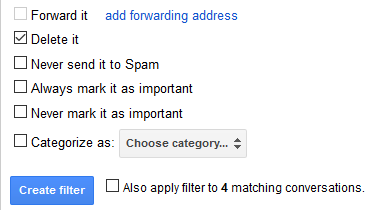 Here we will introduce you to help prevent and limit the spam messages sent to your mailbox. 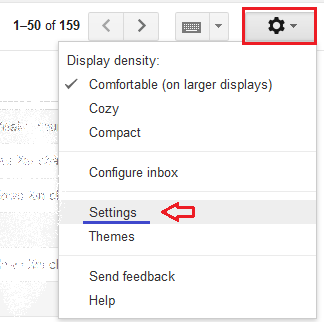 2. click the Settings icon at the top of the right side of the inbox, select Settings. 3. Click Filters and Blocked Addresses tab in Settings. 4. Click on the link Creat a new filter. 5. In the “Has the words“, type keywords “in: spam“. Choose “Create Filter with this search“, then select “Delete it” and click “Create filter” to complete. However, this filter can not work in an absolutely accurate way, so sometimes, you also need to check the spam deleted in Trash folder.